Transforming the skin from the inside out! LED light therapy has been thoroughly tested, evaluated and validated by hundreds of universities, medical labs and even by NASA. It is a new and emerging therapy in the beauty industry that uses the natural healing power of light. It works by exposing light to the skin surface, which activates the skin’s photoreceptors and lets the skin cells absorb its energy. It accelerates cell biochemical circulation and stimulates the production of collagen among other processes. The LED face mask treatment works on the skin at the cellular level, targeting a variety of skin issues, such as acne, ageing and pigmentation. Our illumination face mask is an exciting device combining 3 therapies – Galvanic, Oxygen and LED, to offer a popular and results-driven treatment. It can be integrated into a number of treatments as an add-on or as a stand alone treatment. The results show significant improvements in the skin. The procedure…It’s very simple! The illumination LED face mask will be placed over the face and neck and adjusted for your comfort. The suitable wavelength (colour of light) will be chosen by your professional Renaissance therapist and all you have to do is relax for 20 minutes. We can’t tell you how much blue LED light therapy can help with reducing acne/breakouts. It’s non-invasive, has no chemicals, not harsh to the skin and no medications involved – its one of the best ways to target your breakouts. One of the problems with acne/breakouts is that finding the cause can be difficult, it could be hormonal, stress, diet, skincare etc. 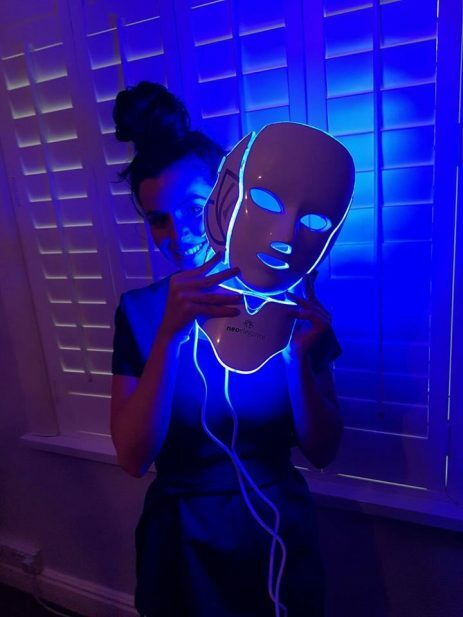 However blue LED light can help to reduce the breakouts, the redness and acne cysts – we’re not saying it will completely cure it, because like we said unless you address the cause of the acne, nothing will completely stop it. Managing it well without causing other skin concerns is key! We’re sure you all know that as you age the amazing cells keeping you young and healthy eventually start to decline, aiding in the ageing process. You can opt for botox and fillers or you can try alternative treatments like red light therapy. Red light therapy ranges between 600nm to 850nm wavelengths and it works on the skin at the cellular level, hence why it’s great for reducing signs of ageing. What are the benefits of red light therapy in anti-ageing? Boost your skin cells. Stimulate enzymes to boost cell turnover, increasing circulation and improving overall skin health. Smooth wrinkles. Increased production of collagen and elastin, firm and smooth the skin giving a youthful appearance. Even skin tone. The red light therapy repairs cells to diminish discoloration. Reduce photodamage. Using red light therapy after sun exposure reduces the cellular damage caused by the harmful UV rays, thus will also help prevent signs of ageing typically caused by sun damage. LED light therapy works to speed up your body’s healing process and in turn helps to reduce bruises and redness. This is one of the reasons why professionals have integrated it into their treatments especially microneedling, chemical peels and lasers – these treatments when you opt for the higher intensities can have some downtime associated with them. Using LED light therapy after these aggressive treatments can help to speed up the healing process so bruises and redness subside quicker and reduces the downtime. The best wavelengths for this are red and near-infrared.